Plot During the days leading up to war in the year 1971, India’s secret service agency RAW, sends Romeo into the heart of Pakistan to extract vital information on the neighbouring country’s plans against India. But when Romeo, disguised as Akbar, is identified, it becomes difficult for him to survive in a land he does not belong to and in a job he wished he had not taken up. Indian Research and Analysis Wing (RAW) agent Ravindra Kaushik, who was better known as ‘Black Tiger’, was one celebrated Indian spy, whose life has inspired several espionage thrillers in Bollywood since a very long time. Though most of the films were mere inspirations, the recently released ‘Romeo Akbar Walter’, starring John Abraham in the lead, claims to be somewhat based on the life of Kaushik. But sadly, director Robbie Grewal’s film fails to thrill us in any way. As the film begins, we see the bloodied face of a man being beaten and tortured in a Pakistani jail. His agony is too intense but he does not flinch. And when he does, he lets out a cry so loud that it sets the mood and tone of the film right. As our expectations soar high enough, the screen goes dark and then comes on the flashback sequence of this battered man during the Bangladesh Liberation War of 1971. RAW chief Shrikant Rai (Jackie Shroff), with an eye for detail, spots a young, reticent theatre artist Rehmatullah Ali aka Romeo (John Abraham) – a bank teller by day – at one of his performances, and decides Romeo’s mastery in donning several hats will help the country play a crucial role in the days to come and that Romeo will be the perfect choice to be sent to Pakistan as an Indian undercover agent. Though Romeo, the son of a fallen Indian Army major, has vowed never to join the forces, he is recruited by the secret service agency, which will require him to get into the other side of the border and deliver as much information as possible, from right under the neighbours’ noses. Soon, Romeo becomes Akbar Malik from Liaqatabad in Karachi, Pakistan. During his course of action, he slowly but steadily connects with higher-ups in the Pakistani military and starts extracting and sending out secret messages back home, providing vital information of Pakistan’s plans (sounds like ‘Raazi’?). But then, it doesn’t last long, and Akbar’s cover is blown. What happens next should not have been anybody’s guess in an espionage thriller, but then in ‘Romeo Akbar Walter’, it does! After Akbar is left in the lurch by the agency that hired him in the first place, he starts to fend for himself in a country that is foreign to him as are its people. Inter-Services Intelligence’s (ISI) men, including a menacing and tough operative (Sikander Kher) are baying for his blood, but soon enough, Akbar takes on a new identity of Walter Khan (the reason for him doing so might make you facepalm). The revelation towards the end of the movie seems as if the secret had been out in the open all the while. There is no big deal about it. 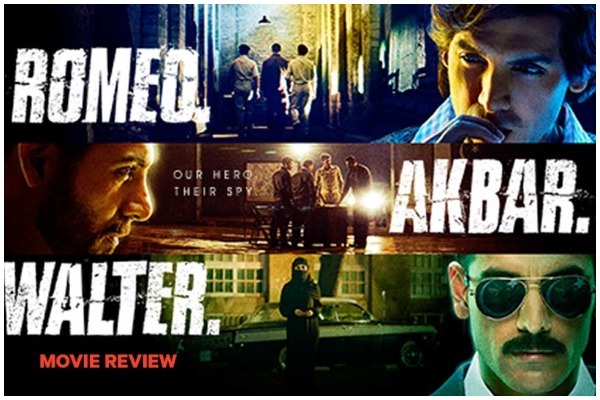 ‘Romeo Akbar Walter’ is a well-intentioned spy thriller, which has its thrill moments, but they do not last too long. Several cat and mouse chases and some action sequences thrown in good measure do not make a spy movie more interesting. A thoroughly-woven script, too, defines the intention of a film, which unfortunately is missing here. The actors put up a fine show overall, but the hackneyed plot spoils it all. The screenplay is uninspiring and so are the songs and the background score. Some scenes also stick out like a sore thumb. For example, the exchange of covert information at a public bar or the handing out of arms in secret, which though are very apparent. (Also, it is tough to digest that India’s topmost secret service agency hires locals just like that, without doing a background check or even giving proper training!) A crisper editing and attention to minute details could have worked wonders for the film, instead of focusing too much on John’s various avatars. John Abraham is new to the spy thriller genre, but his acting skill set is the same as the other movies he has done before. Sporting a singles, wooden expression, talking in a monotone and flexing his muscles every now and then is what we have seen him do in all of his previous movies. There is no freshness in his character. On the contrary, Jackie Shroff and Sikander Kher are quite impressive in their roles. Mouni Roy as Abraham’s love interest is a waste of time in an otherwise average film. Alka Amin as his mother is pitch-perfect, while Raghubir Yadav as his colleague is good. All in all, ‘Romeo Akbar Walter’, which could have been a taut spy thriller, turns out to be a damp squib after all.